As magical as the end result turns out to be, kitchen cabinet remodeling can be quite a thoughtful process for any homeowner. Whether you do it for your own kitchen, or just to increase the value of your home going on rent, you need to think thoroughly and make an optimum choice that will give you return on your investment or may be a re-investment. Numerous options of cabinet materials, designs and types can make your decision difficult, but a careful evaluation from different suppliers can give you great value for your money. Kitchen cabinet remodeling can vary from just coating a new shade of paint or going for a complete replacement of the cabinet hardware. Apart from that, you should re-consider the functionality factor of your kitchen cabinets. 1. Are your kitchen cabinets serving their purpose? Or would some drawers be better near the cook top area? 2. Is there any deadlock caused by opening neighboring doors? 3. Do you have a noisy cabinet set? 4. Are the kitchen cabinets too few or too many for your needs? 5. 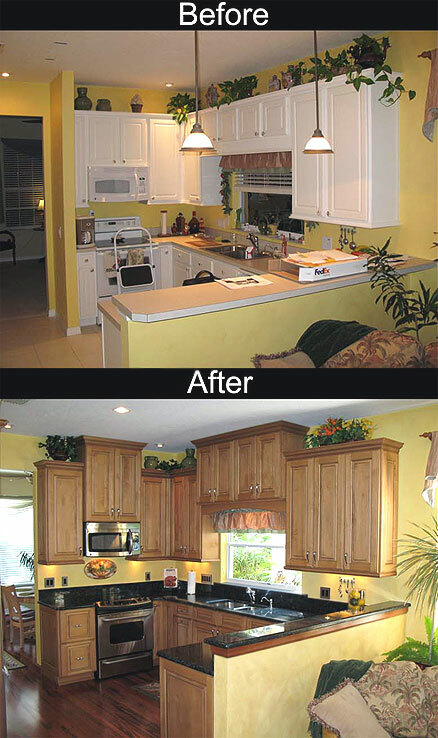 Are you simply bored of the plain wood bland look or just wish to upgrade the look of your cabinets? In case your kitchen cabinets are suffering on their functionality part then you would need some extensive replacement of cabinet hardware with one that is more functional and easy to use (for example putting more drawers or changing the storage portions inside the cabinet etc.). However if it is just the look that is bothering you, then you may consider re-facing them with a new design or go for a change of cabinet doors. Some suppliers may also be able to do a computer generated kitchen cabinet remodeling before your final purchase. This can ease off your botheration of the final look and at the same time help getting the exact arrangement, as you plan to get, in real time. Cabinet set (in case of total replacement). Cabinet doors (in case of just changing looks). Re-facing materials (like a laminate, paints, handles, knobs etc.). Cabinet interiors (hinges or just some drawer pulls). In case of complete change of your cabinet hardware, you would have to look for quotations from woodworkers or experts in kitchen cabinet replacements as this process can turn out quite a tedious task to do it yourself and can extend over months. Once you are clear about your kitchen cabinet remodeling options and the associated costs, you can chart out ideas for a new look. In case you are looking to just change the looks for your cabinets, you can go for cleaning cabinets, refinishing or repainting them. Check out some themes for painting cabinets, which can renew the look of your kitchen completely. You could also add some glass panel, tinted glass or just some piece of glass artwork! This would add that personal touch to your kitchen cupboards. You can also experiment with handles and knobs to suit your style. Try some golden color handles and knobs for that vintage look or contrast your white cabinets with black ones! Or accessorize the existing handles with some colorful rings to add a fresh look. Even changing hinges can bring about a change in how your kitchen cabinets open and close – reduce that slamming noise by changing hinges of your cabinets. As simple as it sounds, the cabinets may have lost their sheen with time and need some cleaning, varnishing or wax. This is certainly the easiest way to renew them before you jump to spending for newer ones. Chart out your needs, check the options available, estimate the costs for the same and remodel your kitchen cabinets in the style you wish to re-create. There is always a cost effective option available, just work your way out for one and yet impress your guests with your innovative kitchen cabinet remodeling. In the meantime, here is software that would also help you realize your kitchen cabinet remodeling ideas.